In 1952, Nathan Swartz bought half of Abington Shoe Company in Abington, Massachusetts. In 1955, Mr Swartz purchased the remaining interests in Abington. The TIMBERLAND name was developed in 1973, the same year the company created its first boot that was guaranteed to be waterproof. TIMBERLAND, long known for their signature waterproof boots, also offers additional outdoor products like men’s, women’s and children’s clothing and accessories. One of the company’s signature accessory product lines is their watches. TIMBERLAND watches were added to their product line in the 1990s; and they are not only durable enough for outdoor activities but also stylish and functional enough to wear every day, with a number of styles and colors available for men and women. For those who prefer simplicity, promptness and sophistication, the TIMBERLAND watches are a must have to flaunt their style statement. 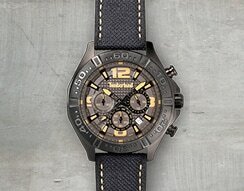 TIMBERLAND watches follow with the same traditions of the company’s other outdoor gear. Rugged, durable and dependable for whatever nature can throw at them. Stainless steel cases and backs resist tarnishing and are hypoallergenic for those with skin that is more sensitive. All models are water resistant, some up to 100 meters or 330 feet, allowing them to continue to function properly even if you are into scuba diving. Crown protectors are created with mineral crystal, a hard glass composite that is more resistant to breaking or scratching than typical glass or plastic. Many models of TIMBERLAND watches offer chronograph functions. Having the ability to time something is an important aspect of numerous activities. Whatever the event, timing it will be precise due the quartz movement inside the watch. Some include a turning bezel that allows elapsed time to be measured.